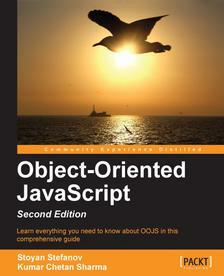 Chapter 1's coverage of ECMAScript 5 describes strict mode and the section on object-oriented programming introduces basic object-oriented concepts such as objects, classes, inheritance, encapsulation, aggregation, and polymorphism. A section in Chapter 6 discusses "inheritance" via "copy[ing] the properties you like from one object to another." It covers shallow copy and deep copy approaches as well as use of a custom object() function that "accepts an object and returns a new one that has the parent as a prototype" (prototypal inheritance/Object.create()). Other items related to inheritance discussed in this chapter include multiple inheritance, mixins, parasitic inheritance, and borrowing a constructor. Several of the properties of the window object are introduced and briefly described in Chapter 7:window.location, window.history, window.frames, window.screen, window.open(), window.close(), window.moveTo(), window.resizeTo(), window.alert(), window.prompt(), window.confirm(),window.setTimeout(), window.setInterval(), and window.document. A section of the chapter explains the DOM and how to traverse it and style (CSS) elements on it. Code listings, even in the electronic edition I reviewed, are black text on white background with no line numbers and no color syntax.